This sauce is an amazing marriage of a traditional Italian pasta sauce with some spicy Southwest style seasonings. Don’t be scared away, this is not a hot pasta sauce. It is very flavorful, though. Sweet and pungent, I could eat this stuff by the spoonful. Ingredients: tomato sauce (tomatoes, citric acid, natural flavor), tomatoes (tomatoes, tomato puree, salt, citric acid), water, onion, red chile, lime juice, garlic, sugar, parsley, salt, basil, oregano, thyme, bay leaves. 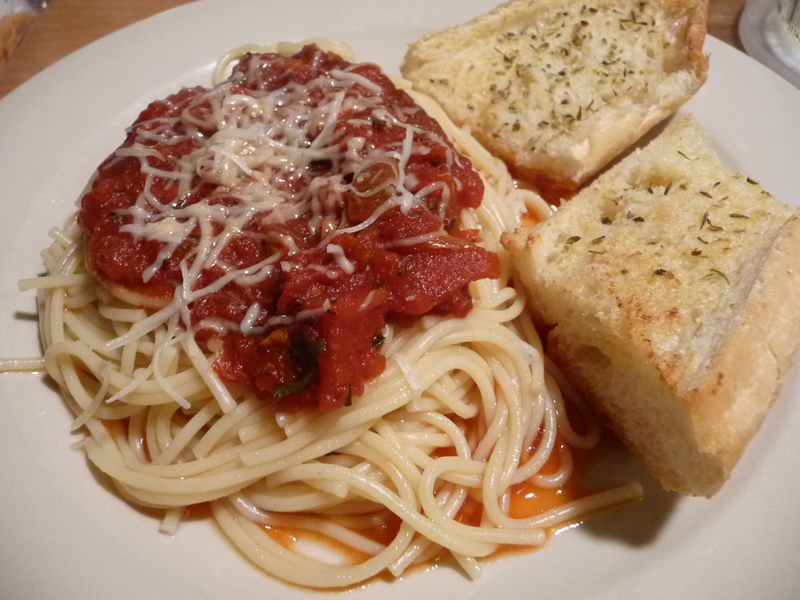 We gently heated about 1/2 of the big 26 ounce jar for our dinner – simply spagetti with some garlic bread. Marilyn and I both declared it one of the best jarred pasta sauces we’ve ever had. 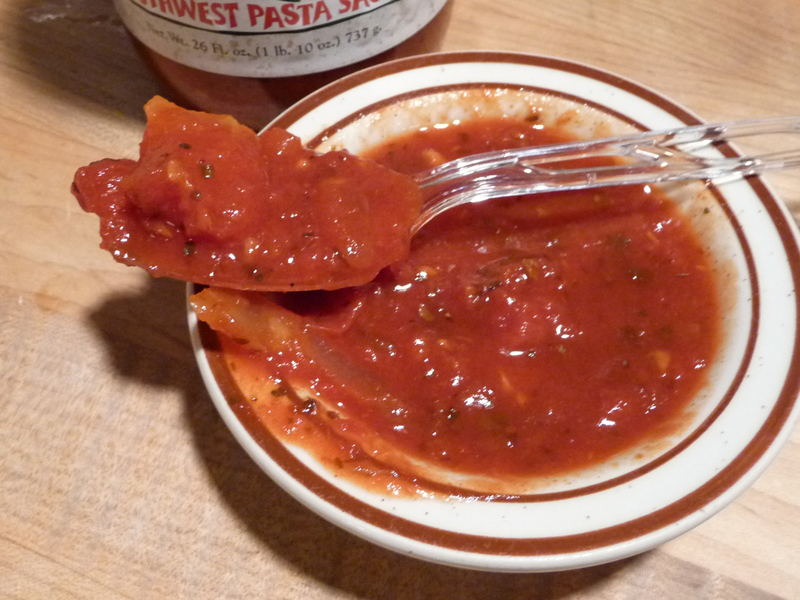 I would love to have a jar or 2 of this pasta sauce on hand, always. And I think I just might do that. Texture & Appearance: Big, bold and chunky. Nice bits of garlic and tomatoes and other spices abound. It’s almost a Gazpacho soup that is ready to eat! Taste Straight Up: Spicy, pungent, fragrant – like Italian laced candy for your nose and mouth. Just. De. Licous. Really. Heat Level: – nowhere near an arriabata or a “fra diablo” heat level, the heat in this pasta sauce is light, quick and bright and leaves quickly. You’ll keep eating it, as it is just spicy enough to have you wanting more. (Remember, I could eat this by the spoonful?). Label/Graphics: A beautiful scene on the label features a dried chile rastra in front of a field of peppers with the New Mexico mountains in the background. 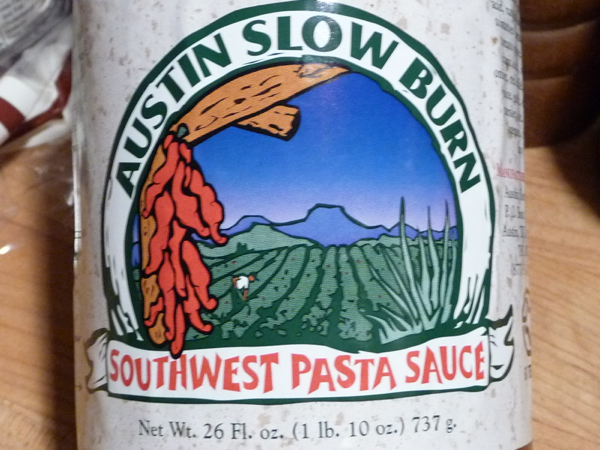 Framed by the lettering of our host sauce maker, Austin Slow Burn, and the title of “Southwest Pasta Sauce” – there is no doubt that this sauce is exactly what it says it is. Overall Rating (Taste on Food, Final Thoughts): – We had it on pasta. Amazing. Another top ten product for the year, for sure. You can visit Austin Slow Burn to learn more about the company. It’s one of those secrets that Austinites have known about for YEARS! Jill and Kevin Lewis are two of the nicest and most hardworking people I know. Their very first product (Rosemary Habanero Jelly) is my go to for slathering on chicken before roasting. The pasta sauce is a pantry staple. If you buy a case, you’ll have enough to get you through the winter! Thanks Jane. You Austinites are lucky for many reasons, and Austin Slow Burn is but one of them! This is the BEST jarred sauce I’ve ever had. Would love to have several jars to have onhand for the long winter coming, when we need a go-to sauce for a quick night dinner.. amazingly good! Thanks for the amazing review and all the compliments for our Southwest Pasta Sauce! I know we eat the heck out of it. Nice to know others are liking it as well! You are welcome! I’ve updated the post to include the links for folks to order and buy some. You can bet we’ll be buying more as well. That’s a new one to me, it sounds good.